Believe us when we claim that your dog will love the fantastic taste of our oven baked dog treats. The treats have a pleasant consistency and smell, making them suitable for rewards and incentives. A few treats each day will help keep your dog’s teeth and gums healthy. Magnusson Hundgodis Kex with fresh beef is a tasty and healthy product made from farm fresh Swedish ingredients and contains fresh Swedish beef, eggs and carrots. 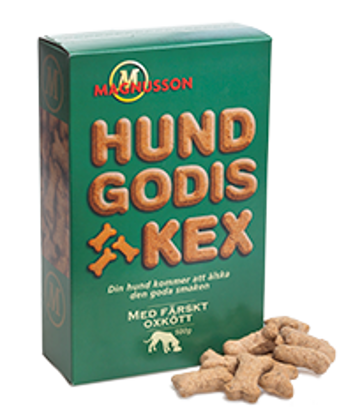 With its great taste, enticing smell and enjoyable consistency, Magnusson Hundgodis Kex with fresh beef makes the perfect reward! 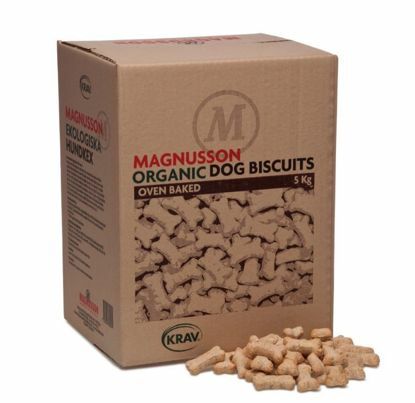 Magnusson Organic Dog biscuits are produced from organic Swedish ingredients. By using organic ingredients, we can contribute to a better environment and an open landscape with a good biodiversity. 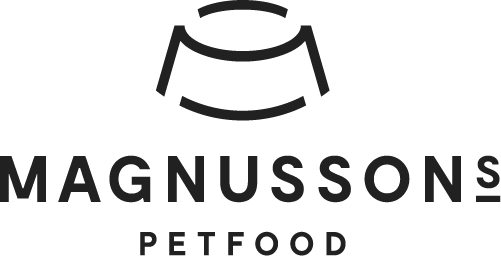 If you want to reward your dog with excellent quality dog biscuits, then Magnusson Organic Dog Biscuits is the perfect choice!